EAST COAST HOCKEY Source For Sports ® Laurel, MD Rockville, MD Abington, MD Chesapeake, VA FIVE HOLE Source For Sports ® Raleigh, NC Wake Forest, NC GOAL LINE Source For Sports ® Scho eld, WI HOCKEY SERVICES Source For Sports ® Kalamazoo, MI Kalamazoo, MI JT'S SLAPSHOT Source For Sports ® Windsor Heights, IA KOSPORTS HOCKEY Source For Sports ® Canonsburg, PA New Kensington, PA RG HOCKEY Source For Sports ® Fort Wayne, IN Romeoville, IL RINKSIDE Source For Sports ® Tampa, FL Wesley Chapel, FL STRAUSS Source For Sports ® Maplewood, MN ULTIMATE SKATE & HOCKEY Source For Sports ® Anaheim, CA El Segundo, CA WE'VE JOINED FORCES WITH THE WORLD'S #1 SPECIALTY HOCKEY RETAILER SAME GREAT STORES + NEW SOURCE EXCLUSIVE GEAR = THE BEST VALUE IN THE GAME. Each of our 160+ Source For Sports ® stores across North America are independently owned and operated by a member of the local community. 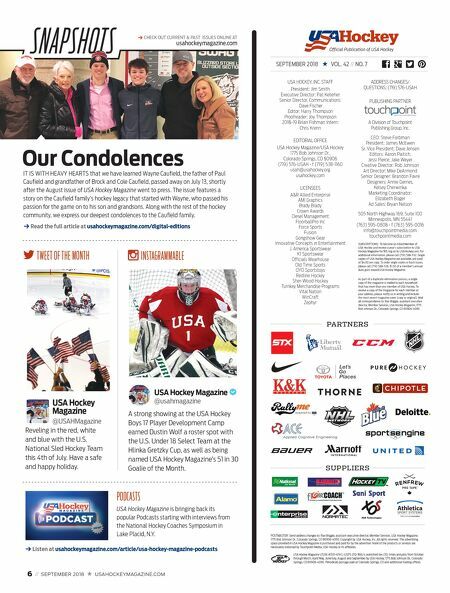 Source For Sports is a registered trademark of Sports Distributors of Canada Ltd. EAST COAST HOCKEY Source For Sports ® Laurel, MD Rockville, MD Abington, MD Chesapeake, VA FIVE HOLE Source For Sports ® Raleigh, NC Wake Forest, NC GOAL LINE Source For Sports ® Scho eld, WI HOCKEY SERVICES Source For Sports ® Kalamazoo, MI Kalamazoo, MI JT'S SLAPSHOT Source For Sports ® Windsor Heights, IA KOSPORTS HOCKEY Source For Sports ® Canonsburg, PA New Kensington, PA RG HOCKEY Source For Sports ® Fort Wayne, IN Romeoville, IL RINKSIDE Source For Sports ® Tampa, FL Wesley Chapel, FL STRAUSS Source For Sports ® Maplewood, MN ULTIMATE SKATE & HOCKEY Source For Sports ® Anaheim, CA El Segundo, CA WE'VE JOINED FORCES WITH THE WORLD'S #1 SPECIALTY HOCKEY RETAILER SAME GREAT STORES + NEW SOURCE EXCLUSIVE GEAR = THE BEST VALUE IN THE GAME. Each of our 160+ Source For Sports ® stores across North America are independently owned and operated by a member of the local community. 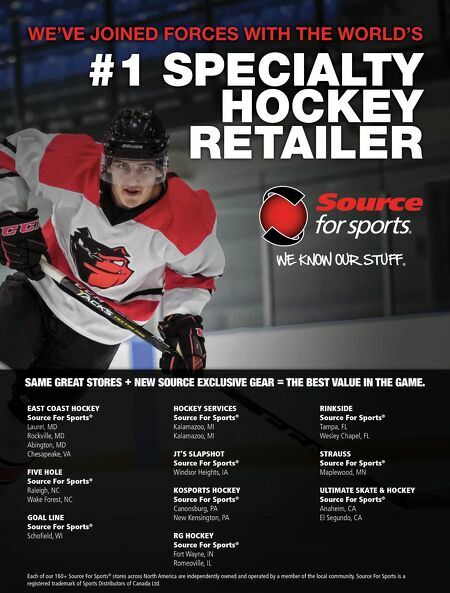 Source For Sports is a registered trademark of Sports Distributors of Canada Ltd. EAST COAST HOCKEY Source For Sports ® Laurel, MD Rockville, MD Abington, MD Chesapeake, VA FIVE HOLE Source For Sports ® Raleigh, NC Wake Forest, NC GOAL LINE Source For Sports ® Scho eld, WI HOCKEY SERVICES Source For Sports ® Kalamazoo, MI Kalamazoo, MI JT'S SLAPSHOT Source For Sports ® Windsor Heights, IA KOSPORTS HOCKEY Source For Sports ® Canonsburg, PA New Kensington, PA RG HOCKEY Source For Sports ® Fort Wayne, IN Romeoville, IL RINKSIDE Source For Sports ® Tampa, FL Wesley Chapel, FL STRAUSS Source For Sports ® Maplewood, MN ULTIMATE SKATE & HOCKEY Source For Sports ® Anaheim, CA El Segundo, CA WE'VE JOINED FORCES WITH THE WORLD'S #1 SPECIALTY HOCKEY RETAILER SAME GREAT STORES + NEW SOURCE EXCLUSIVE GEAR = THE BEST VALUE IN THE GAME. Each of our 160+ Source For Sports ® stores across North America are independently owned and operated by a member of the local community. Source For Sports is a registered trademark of Sports Distributors of Canada Ltd.